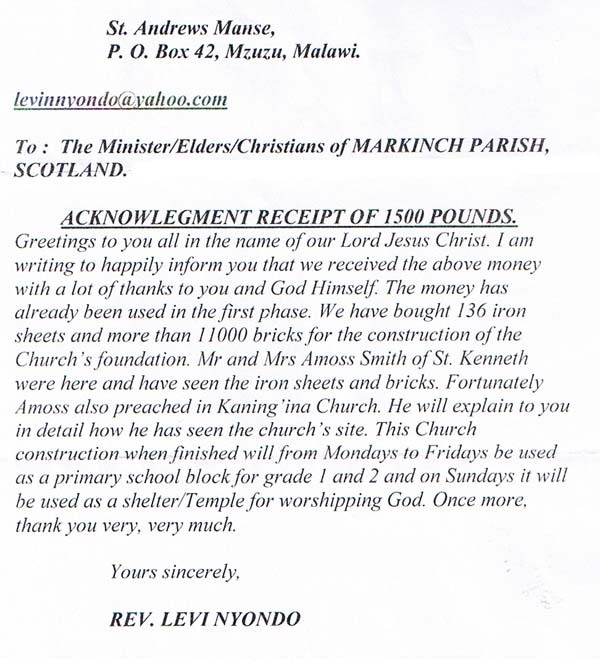 The Kirk Session decided to assist with the building of a new Church in Malawi. The opportunity arose through Rev. Levi Nyondo, the minister of St Andrews Mzuzu (a town centre church with various outlying rural prayer houses). He was the host for the St Kenneth’s team from Kennoway that went to Malawi. This new group of Christians need a place to worship. The cost of providing that is relatively small by Scottish standards but fairly prohibitive in a subsistence farming area with little cash. As a result there was an opportunity here for our congregation to undertake a one-off project of providing a basic building for a new church in Malawi. (Often such buildings double up as school rooms at the same time.) From past experience the cost of corrugated iron roofing and timbers is usually about £1200, and the bricks are made and the construction done by the local congregation. St Kenneth’s will help by making the local connections, providing a route for the transfer of funds with no bank charges, and getting our local contacts in the area to give details when the work is complete. Funds have already been sent but these have to be replaced by holding specific fundraising events during the year. Please watch out for these. Our target is £1500. We may explore a partnership arrangement with the church at a later stage but no decision has been reached in this regard.